It just goes to show, if you want to keep your local bikeway in good shape, it can’t hurt to set up a Twitter account for it. In recent years folks have been tweeting on behalf of the Dearborn, Clinton, and Halsted bike lanes, drawing attention to issues such as illegal parking and poor snow clearance. 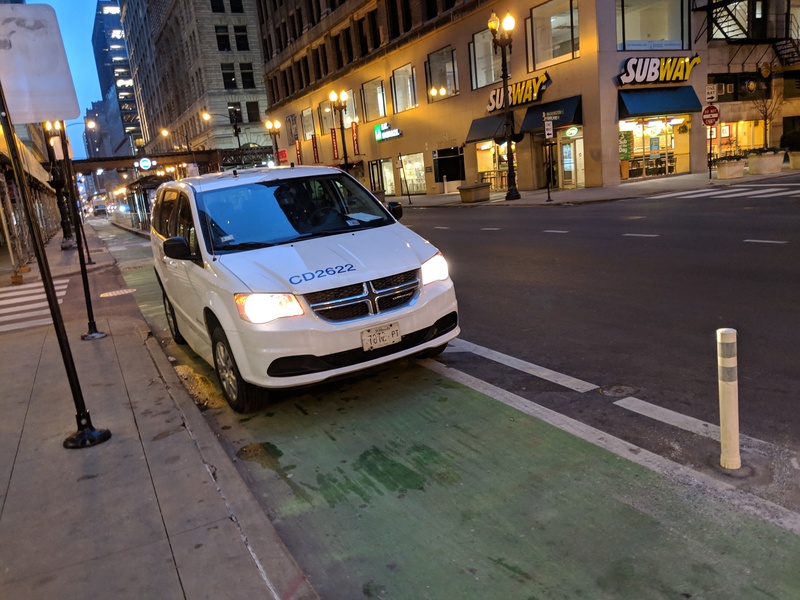 Last July someone launched a Twitter account to highlight a very specific bikeway problem: chronic issues with drivers parking illegally in the short stretch of the Washington Street bike lane between Wabash and Michigan avenues. To be exact, the problem is on the very short segment east of the alley between Washington and Michigan, one of the few stretches of Washington in the Loop where the bike lane lacked physical protection. Even though the bike lane is painted bright green, motorists have been ignoring that visual cue and have frequently parked or stood there while making deliveries or quick stops. While this might seem like a minor annoyance, the illegal parking makes it more challenging for cyclists to navigate the intimidating Washington/Michigan intersection, where the city installed a dedicated bike signal last year. The 84EWashington account has tirelessly chronicled the issue, tweeting to the Chicago Department of Transportation to draw attention to the problem and requesting that flexible plastic posts be installed to keep cars out of the bike lane. This week the tweeter finally got their wish. According to CDOT spokesman Mike Claffey, the posts were installed on Tuesday. Other recent bikeway improvements in the area include a curbside bike lane on Michigan and a protected bike lane on mid-level Randolph, providing a connection between the Loop and Lakefront Trail. In addition to 84EWashington, Bike Lane Uprising, a website run by Christina Whitehouse that documents bikeway obstructions, as well as the many other cyclists who reported vehicles in the Washington lane via the site, deserves credit for pushing the city to fix the the problem. The new posts on Washington haven’t completely solved the illegal parking issue — some drivers are going around the bollards, choosing to ignore the obvious cues that they’re not supposed to park there. More posts or, better yet, concrete curbs would largely stop that. But it’s great to see that some online activism spurred CDOT to address the issue. It might be worth trying this approach to draw attention to bike lane problem spots in other parts of the city. Any word on how CDOT decides on the spacing and post type? I’ve seen different spacing all around the loop and at least three different types of posts. I believe the city’s formula nowadays is: [Length of the stretch to get posts] divided by [number of used bollards sitting around CDOT’s storage yard, minus one] = distance between the posts. Just kidding, it’s not clear that there’s a particular rule for this, as it seems to vary by location. However, it couldn’t hurt for cyclists to do some more online lobbying to encourage CDOT to install more posts on this stretch of Washington. I rode by while they were being installed, and was quite pleased. Sadly, it isn’t just average drivers ignoring the green/bollards. Someone who definitely should have known better was blocking it Thursday morning. And no, they weren’t mid pickup/drop-off. They came out of the Subway across the street as I pedaled away. What’s ridiculous about the people stopping in that lane is that on either side of the street there is a service alley where it is very easy to make a quick stop for a pickup, delivery, or other need. Lazy idiots. It also seems deliveries should be regulated to a side street. Uber and Lyft need to better educate and restrict drivers as well. Bike mounted police ticketing and education is needed also. 311 should allow for photo ticketing. Other countries do this. They are cheap and simple to glue down, more are clearly needed. Some have even been done DIY by activists.